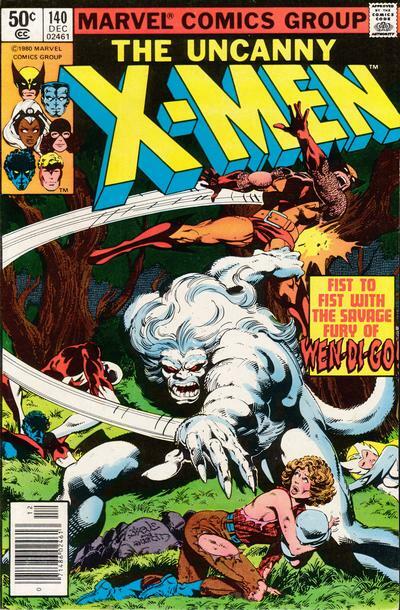 Let’s face it Wendigo is one of the coolest Marvel Comics characters ever and X-men # 140 from 1980 is probably the BEST portrayal of him as being drawn by John Byrne. Not only is the cover to this comic 100% classic but the whole story is just damn awesome. The real story starts in X-men # 139 as Wolverine and Nightcrawler head off to Canada to help none other than Alpha Flight take down the vicious beast. I miss simple storylines like this one which features them all shacking up in a cabin in the woods together. This is one of the classic Claremont/Byrne isssues and may be a bit pricy in it’s original form-but it can be found reprinted several different places-Long live WEN-DI-GO! have you ever seen the movie Ravenous with Guy Pierce? Rad frightening wendigo story! Kinda off topic but yeah that whole mythology is pretty awesome. Yeah who ever read power pack anyway?? The Avengers Movie: No Giant Man?? !